That’s right, I said it. Poopy Humor. And for those of you who know me, you knew this post was coming sooner or later. I’m not sure at what age one should stop laughing at poopy humor. But this is the way I look at it…my grandkids and I will be on the same wavelength. We’ll be the best of friends. Speaking of friends… mine always come to me when they have an off-color story to tell. They feel safe. They know it’s a no judgement zone. One subject that comes up a lot are the problems with using the restroom at work. So, let’s talk about that. Personally, I avoid the “poop at work.” Unless it’s inevitable. In those cases I walk clear across the building to another department’s restroom so somebody else gets blamed. Some of my co-workers read my blog… so I guess the secret’s out. But, for my co-workers who brave the world of the public restroom — the peek-a-boo doors, and the deafening silence — I applaud you. We’ve spoken. I’ve heard your pleas. And I’ve openly wept for you. One of the worst experiences is the STANDOFF? thing as you. You know this by the amount of time you both spend sitting there….you could hear a pin drop. Who will go first? Who will take the plunge? The chance of the peek-a-boo fart. 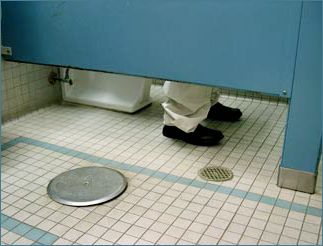 You know they can see your shoes and pant legs under the stall. They know who you are. If you go first, they’ll tell others. It’s maddening. This is the person who talks to you while they’re washing their hands. You want them to leave. You pray that they’ll leave. And nobody likes “tinkle talk.” It’s one or the other, people. And we all attempt the MISSION IMPOSSIBLE. Getting out before anyone sees you. The worst is when you’re washing your hands and a co-worker walks in. You are defeated. You lose. You see the expression on their face. It’s like “WHOA!” …and, you’re caught. Just had to add this link to my friend’s blog from January. It’s hysterical!! !